Here’s a great free app that encourages kids to explore with the iPad’s Camera. Plum’s Photo Hunt is part of PLUM LANDING, an environmental science media property designed to get kids excited about exploring the wonders of our planet. Plum is a little alien who sends kids on missions to take photos. The developer is PBS Kids, producers of great TV shows for children in the USA. 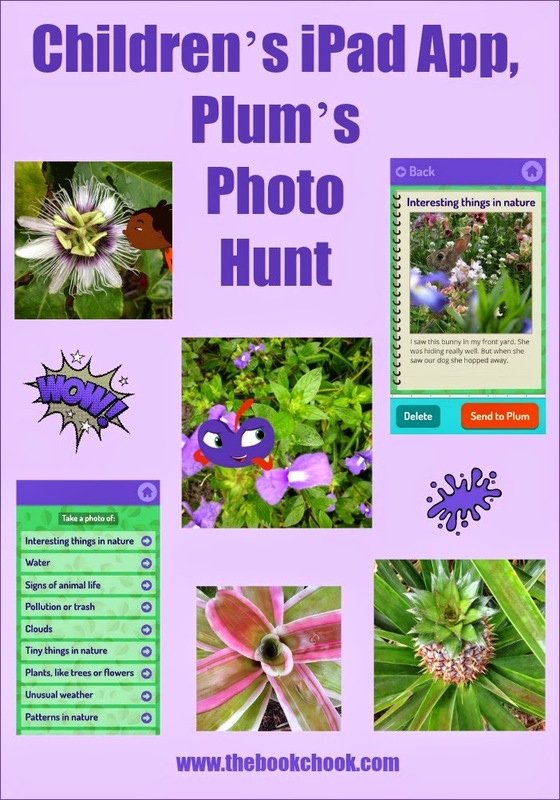 Plum’s Photo Hunt is based on the PBS KIDS web-original PLUM LANDING, developed by WGBH, producers of award-winning kids programs such as ARTHUR, CURIOUS GEORGE and MARTHA SPEAKS. Targeting kids ages 6-9, the app is designed to extend the series’ environmental science curriculum. WGBH worked closely with teachers and advisors to develop Plum’s Photo Hunt. What I like: I love the emphasis on children really looking around and observing things. The missions are like photo prompts that encourage kids to focus on looking through the camera viewfinder at the world around them. Topics like Bugs, Shadows, Patterns and Sunlight tie in with children’s natural curiosity. After some moments testing the app, I even found myself becoming more conscious of patterns in my own garden! There are not only photo missions, but also photo bombs (the chance to add a PBS character to a snap) and a field journal for kids to organise and keep their field observations. A text box pops up and kids can type their sentences next to each image they choose. This free app ties in nicely with beginning science studies. Photos taken can be saved to the camera roll, and could be used in all sorts of projects and writing activities. If you’re interested in using the iPad educationally with kids, you might like to read iPad Photography Ideas for Kids, Creating with Kids and iPad Apps and Ways Kids Can Create Images with iPad. Check out my other iPad App Reviews on Pinterest.